The ABL family of non-receptor tyrosine kinases, ABL1 and ABL2, are upregulated in non-small cell lung cancer and promote lung cancer metastasis. Recent work has shown that ABL kinases promote lung cancer brain metastasis and colonization. Global transcriptome analysis of targets controlled by ABL kinases in lung cancer cells revealed SLC7A11 as being differentially regulated in ABL inhibited cells. SLC7A11 encodes the plasma membrane antiporter system xCT which has been shown to be overexpressed in cancerous cells. System xCT exports glutamate and imports cystine, an intermediate molecule in the cellular oxidative stress response mechanism. Real-time polymerase chain reaction (RTPCR) verified a reduction in SLC7A11 mRNA levels following ABL pharmacologic inhibition or genetic knockdown. Continued work is being done to reveal a reduction in cellular protein levels through protein isolation and western blotting. FACS analysis will be deployed to determine whether membrane-localized levels of SLC7A11 decrease upon ABL inhibition. Additionally, a glutamate assay kit will be utilized to determine whether export of glutamate by xCT is reduced in ABL knockdown cells relative to control. The ultimate goal of this project is to understand if ABL kinases promote SLC7A11 expression in order to alter the brain microenvironment and promote tumor colonization. This past week, everyone had the opportunity to present their project to the other BSURFers through a chalk talk. I found Julia’s talk particularly interesting, as her work on Oxidative Stress relates to what I am working on in the Pendergast Lab. Reactive Oxygen Species (ROS) cause cellular damage. By oxidizing amino acid residues, ROS can alter protein structure, causing protein unfolding, aggregation and plaque formation. There are two general mechanism by which the cell responds to such damage: damaged proteins are either degraded or repaired. Julia’s project focuses on a process called ubiquitination. It is the cell’s method of flagging damaged proteins for degradation. K48 ubiquitins are secondary ubiquitin molecules that are attached to the primary ubiquitin’s position 48 lysine (K48) residue. K48 ubiquitination is not understood as well as other forms of ubiquitination. Julia’s project focuses on identifying which enzymes flag proteins with specifically K48 ubiquitins. She is also interested in whether K48 accumulation on proteins following oxidative stress is the result of reduced proteasome activity, or reduced deubiquinating activity. My project looks at ROS from a somewhat different angle. I focus on system xCT, which is a membrane antiporter responsible for importing cystine into the cytoplasm. Cystine is an important starting molecule in an oxidative stress response pathway. Through a number of intermediates, cystine is converted to glutathione, which quenches harmful reactive oxygen species through conversion to glutathione disulfide. While my project looks at how cells quench ROS before they can damage cellular components, Julia’s project focuses on how cells deal with proteins that have been damaged. It was nice to discover a connection between my project and that of another BSURFer, and I would be interested to see whether anyone in Julia’s lab studies the glutathione synthesis pathway. Last week, I had the opportunity to speak with my PI, Dr. Pendergast, about her path in science and the work that she currently does. She developed an interest in research, and particularly in Chemistry and Molecular Biology, during her undergraduate studies at the University of Michigan at Ann Arbor. She received her PhD in Biochemistry from the University of California at Los Angeles. Dr. Pendergast remained at UCLA for her postgraduate work in Molecular Cancer Biology. It was under the mentorship of Dr. Owen Witte that she developed an interest in normal and oncogenic tyrosine kinases, which eventually led to her focus on the Abelson family of tyrosine kinases. Dr. Witte discovered the tyrosine kinase ability of the ABL protein, as well as the role of the BCR-ABL fusion protein in leukemias. The Pendergast Lab researches the role of ABL in a wider range of cell signaling pathways. Dr. Witte was himself mentored by the great biologist Dr. David Baltimore, who received the 1975 Nobel prize in Physiology or Medicine for his work on tumor viruses. The Pendergast Lab consists largely of graduate students. I asked Dr. Pendergast what she values most in students looking to join her lab. She emphasized the importance of understanding what scientific questions to ask. What distinguishes the best scientists, she said, is their ability to formulate important and appropriately ambitious questions, and not to lose sight of how each experiment is connected to these bigger picture questions. Although Dr. Pendergast enjoys advising her students and guiding their work to an extent, she understands the importance of giving them the freedom to be creative and design projects without restrictive instructions. Ultimately, she wants her students to gain the ability to formulate and answer scientific questions independently. I asked Dr. Pendergast for her advice on pursuing a career in medicine versus one in medical research. She suggested that pursuing an MD-PhD gives you a greater range of opportunities than solely an MD (or solely a PhD, for that matter). For one, being qualified in both fields gives you far greater career security, particularly in difficult research funding climates. Additionally, physician-scientists have an edge in that they understand the clinical aspects of medicine to a far greater extent than pure researchers, and the scientific aspects of medicine to a far greater extent than pure doctors. The clinical side gives them an understanding of what scientific questions are most important (in that they can have the greatest impact impact on healthcare), while the scientific side enables them to actually address these questions. Dr. Pendergast also suggested that researchers have a more exciting job than physicians. While doctors perform the same techniques again and again, researchers ask new questions and explore the scientific unknowns. A similar point was made to me by one of the lab’s MD-PhD students. Having experienced both the hospital and lab environments, he argued that researchers, to a greater extent than doctors, make use of the prefrontal cortex which gives humans our enhanced ability for complex thought. The Pendergast Lab, in which I am working this summer, broadly studies the Abelson family of non-receptor tyrosine kinases. Tyrosine kinases are a subclass of protein kinase, molecules which phosphorylate proteins. In the case of tyrosine kinases, the phosphate group is attached to a tyrosine amino acid in the target protein’s chain. This phosphorylation activates or deactivates the target protein, enabling or preventing its function. Abelson kinases, encoded by the genes Abl1 and Abl2, are important molecules in a wide range of cell signaling pathways. Abl kinases are highly expressed in a range of cancers cell lines, suggesting that the pathways in which they are involved play a significant role in tumor development. The Pendergast Lab’s research focuses on mapping out these pathways, and the way in which Abl kinases function within them. My mentor is currently researching a number of metabolic pathways in which Abl kinases are potentially involved, and my project focuses on a protein involved in one of these pathways. The protein, encoded by the gene SLC7A11, is called system xCT. It is an antiporter, a membrane transporter protein which simultaneously imports cystine and exports glutamate. Cystine is an important molecule in the cell’s response to oxidative stress, the cellular damage caused by reactive oxygen species. Recent studies have suggested that oxidative stress inhibits tumor growth, and cancer cells therefore depend on antioxidant response pathways such as the one involving xCT. Blocking this pathway and thereby leaving cancer cells exposed to the tumor-inhibiting influence of oxidative stress may be therapeutically useful. I will investigate the hypothesis that Abl kinases play a role in the activation of xCT expression. I will begin by inhibiting Abl kinases, using the allosteric inhibitor GNF5, and observing the effect on cellular levels of xCT. I will measure the effect at the protein level using Western Blotting, and also at the mRNA level using RTPCR. A decrease in xCT upon Abl inhibition would suggest that the kinases are indeed somehow involved in increasing xCT expression or activation. Further experiments would be required to determine the pathway through which Abl kinases increase the expression or function of xCT, and the other molecules involved in this pathway. As I have started to learn, scientific hypothesis are not always validated. If early results do not correspond to our hypothesis regarding Abl and xCT, I may have to change the focus of my project. However, the process of designing models and experiments to test one’s hypotheses is itself incredibly rewarding, and a good understanding of this process is ultimately more important than individual results. A busy but never boring first week! My first week in Dr. Pendergast’s lab has left me eagerly awaiting the rest of the summer. The days have at times been overwhelming, but more than that they have been incredibly exciting. I was thrown in at the deep end with Monday morning’s lab meeting, during which members discussed the projects they are currently working on. The many abbreviations, graphs and diagrams made little sense to me, despite my having prepared by reading several of the lab’s recent publications in the weeks leading up to that point. Luckily, my mentor Jill, who is a 3rd year PhD candidate in the lab, helped me make sense of everything. In fact, all of the lab’s graduate students have been very welcoming, and have made my start so much easier. They allow me to shadow them during their experiments, give me the opportunity to learn and practice new techniques, and take the time to answer my many questions. My first week in the lab has largely involved coming to grips with the many techniques that cancer biologists use to answer the questions they pose. These include Western Blotting, Reverse Transcription Polymerase Chain Reaction and Tissue Culture, among many others. As tempting as it is to delve straight into the bigger picture scientific questions, I have started to understand the importance of first mastering some of these techniques. They enable scientists to determine which questions can be asked, and how they can be most effectively and honestly answered. Reading published papers gives you the impression that laboratory science is a very smooth and streamlined process, however actually being in the lab reveals that it can often be quite messy and imperfect. Scientists are not the flawless robots that we expect them to be. They are not all-knowing, they can make mistakes, and (perhaps most surprisingly of all) they have real lives outside the lab! However, the scientists with whom I have had the opportunity to work have all been truly impressive people, and hearing their stories about how they got into science and what they hope to achieve in the coming years is a big inspiration for me. I look forward to learning much more from them in the coming weeks! 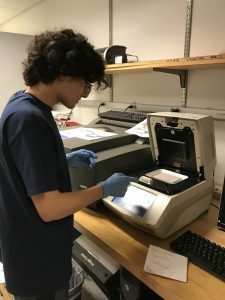 My main goals for the summer are to determine whether I can see myself pursuing an MD PhD and eventually a career in science, to put myself in a good position to continue doing research at Duke in the coming years, and to make some contribution, however small, to a scientific question being asked by my lab.